Julia involves herself in her community in a truly unique way: she chose to continue her participation as a Girl Scout and Girl Scout leader in the United States as a FLEX student. 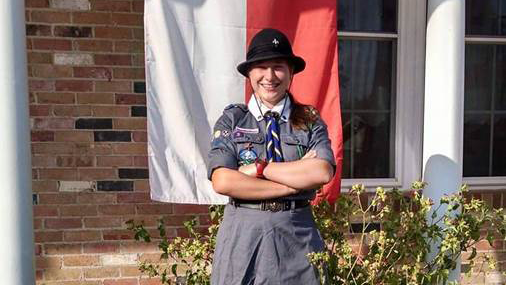 As a Girl Scout in Poland for the past six years, Julia explains that being a Girl Scout “is a big part of my life. I decided to become a Girl Scout in the United States because I wanted to experience another perspective and see how this life-changing organization is working here. It was a very good decision because I can share knowledge and experience that I gained in my Polish troop as well as learn a lot of new things that would be awesome to show when I will be back to my country.” As a Girl Scout, Julia worked on their main project, GIRL (Go-getter, Innovator, Risk-taker, Leader), which coincides beautifully with the FLEX goals, and she presented her experiences as a scout in Poland to her troop. She also shadowed a Girl Scouts Leadership Experience Specialist for her FLEX leadership project, through which Julia learned more about what leadership means to her. Besides Girl Scouts, Julia participated in her community through numerous diverse service organizations. She volunteered at her local hospital, where she welcomed guests and delivered flowers to customers. She also gave out food and spread awareness about breast cancer through a breakfast for breast cancer survivors. Overall, she completed over 50 hours of community service. Julia loves being involved in her high school’s extracurricular activities. She is a member of the Christian club and robotics club. She also played on her school’s soccer team, where she made friends with her teammates. Through these activities, Julia was able to give country presentations at Girl Scouts, the hospital, her high school and an event honoring WWI veterans. With each presentation, Julia uniquely asks at least one person to try on her Polish national costume, which piques the interest of her audience. Julia is a fantastic global ambassador because she devotes herself to a number of diverse activities and groups within her community through which she learns about her host community’s culture and shares her own.